BEIRUT (Reuters) - All 90 people aboard an Ethiopian Airlines plane were feared dead after it plunged into the Mediterranean, minutes after taking off from Beirut in a thunderstorm on Monday. Flight ET409, a Boeing 737-800, heading for Addis Ababa, disappeared off the radar some five minutes after taking off at 2:37 a.m. (12:37 a.m. British time). The Lebanese army said the plane had broken up in the air before plummeting into rough seas. Witnesses described the impact as a "flash that lit up the whole sea" and a "ball of fire." Lebanese President Michel Suleiman said he did not think the plane had been brought down deliberately, emphasising "a sabotage attack is unlikely." Defence Minister Elias el-Murr also said there was no evidence of a terrorist attack and that weather was "in principle" to blame for the crash. Twenty-four bodies, including those of two toddlers, have so far been recovered. At least six bodies were of Ethiopian origin, officials said. Some of the bodies were so unrecognisable from the impact of the crash that DNA testing would be needed to identify them. The remains of mangled aircraft seats and luggage washed up on the shore south of Beirut where the airport's main runway is located. Lebanese army patrol boats, helicopters and divers searched an area off Na'ameh, 10 km (six miles) south of the capital. Marla Pietton, wife of the French ambassador to Lebanon Denis Pietton, was on the plane, the French embassy said. The Lebanese government declared a day of mourning. Prime Minister Saad al-Hariri visited the airport to meet distraught relatives waiting for news of survivors, some of whom were angry that the plane was allowed to take off in bad weather. "They should have delayed the flight for an hour or two to protect the passengers. There had been strong lightning bolts and we hear that lightning strikes at planes especially during take-offs," a relative of one of the passengers told a local television station. Girma said he did not think the crew would have taken off in dangerous weather conditions. "There was bad weather. How bad it is, I will not be able to say. But, from what I see, probably it was manageable weather otherwise the crew would not have taken off," he told reporters in the Ethiopian capital Addis Ababa. 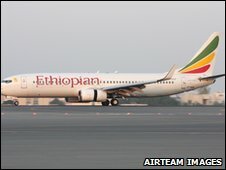 A 14-strong investigation team from Ethiopia including Ethiopian Airlines officials arrived by plane in Beirut to help probe the causes of the crash. Boeing said it was coordinating with the U.S. National Transportation Safety Board to assist Lebanese authorities in the investigation. U.N. peacekeepers in Lebanon, Cypriot police, the British military stationed in Cyprus and the U.S. navy provided helicopters, ships and divers to aid search and rescue. State-owned Ethiopian Airlines has positioned itself as a major player in international air traffic in Africa and has recently expanded its Asian network. Girma said the plane, built in 2002, last underwent a maintenance check on December 25 and no technical problems were found. The plane had been leased from a division of U.S. financing company CIT Group. Ethiopian airlines has regular flights to Lebanon, catering for business clients and the thousands of Ethiopians who work there as domestic helpers. Lebanese aviation sources said some of the passengers had been en route to Angola and other African countries. Last Friday the airline announced an order for 10 of Boeing's Next-Generation 737-800s for a total price of $767 million. The last incident involving Ethiopian Airlines was in November 1996 when 125 of the 175 passengers and crew died after a hijacked Boeing 767 crashed off the Comoros Islands. The crash is the fifth incident involving the loss of a Boeing 737-800, according to the Flight Safety Foundation.